Elgate Products - a family owned wholesale giftware, gifts, giftware, toys, garden products, souvenirs and homewares business was formed in 1971 above a small boat building yard in Margate, Kent, UK. Originally, we specialised in postcards, manufacturing and selling to retail outlets along the South Coast of England, it is sometimes difficult to believe how far we have come from our humble beginnings. Major importers and exporters of wholesale gifts, toys, garden products, souvenirs and homewares, we are situated in Broadstairs, Kent operating from 20,000 sq. 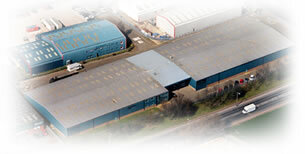 ft. of offices and showrooms, with a further 126,000 sq. ft. of warehousing. Our customer base is extremely diverse, ranging from multiple retailers, wholesale and mail order to small independent retailers. In addition to supplying the UK gift market we also supply a number of clients in Europe, America and beyond with affordable design-led giftware products to suit virtually every type of market. Elgates' studio also offers the facility to design bespoke product exclusively for our clients. For further information please contact us. We are continually striving to source new product and manufacturers to supply our clients with innovative and exciting gift products. In addition over 70% of our product range has been designed in the UK by our talented team of designers and illustrators. Working closely with our manufacturers to achieve a range of high quality gifts, toys, garden products, souvenirs and homewares that are competitively priced, Elgate aims to offer clients a high level of service from our knowledgeable sales force.